If Westerns are your thing then you’re going to enough the Dead Or Alive slot game. Spin in the pair of revolvers to activate free spins, which can be re-triggered and win up to 2,500 times your bet amount on top! NetEnt really have brought it with this machine. 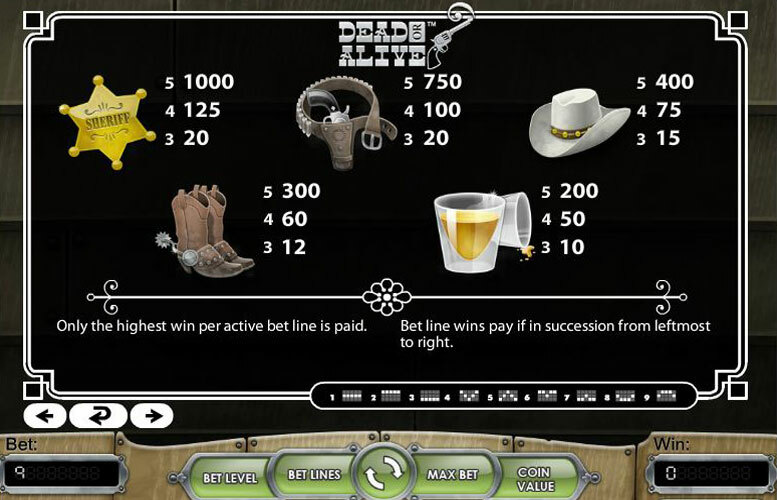 Dead or Alive is an exhilarating slot machine game that takes players back into the cowboy days. 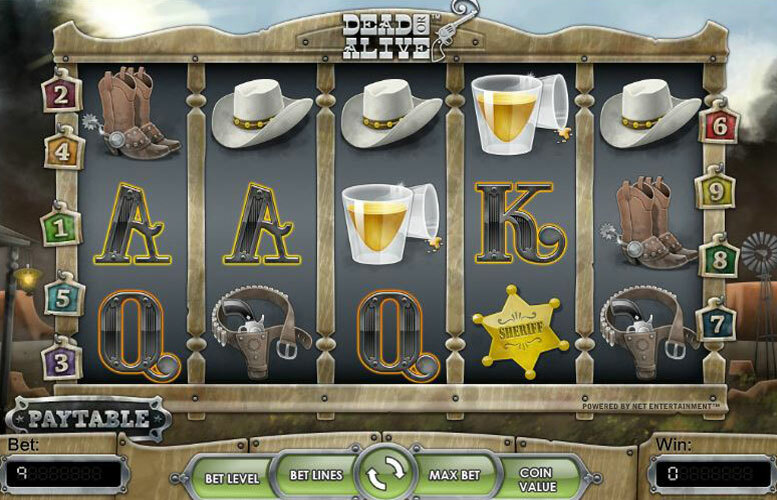 This Wild West themed slot machine features five reels and 9 paylines. 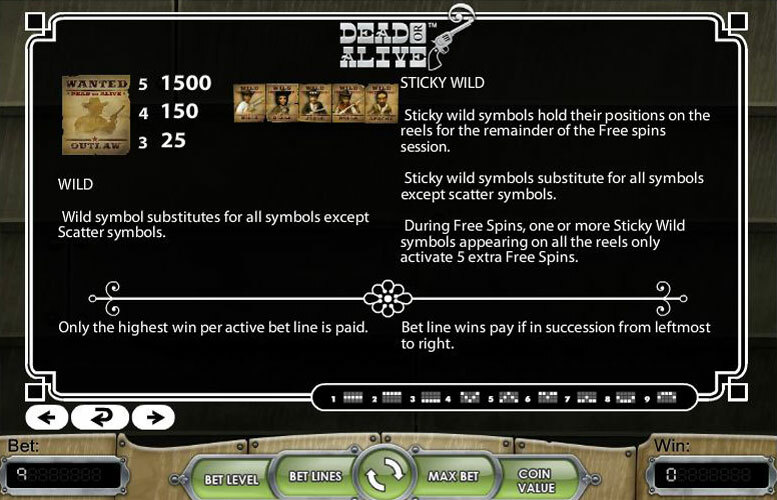 The western styled game comes complete with a number of different special features including a wild, a scatter, and sticky symbols to help players earn more with each spin. Earning sticky wilds can only be achieved during free spins round, when the traditional wild becomes sticky. The sticky wilds will stay on the reels for all of the free spins. This game is a little odd, as the highest pay out actually comes from the scatter rather than the wilds. The payouts are relatively low in comparison to most slots games, but the graphics and music do help lend a real Wild West feel to the game. The top jackpot here is 57,000 coins which can be won if you run hot during free spin rounds. 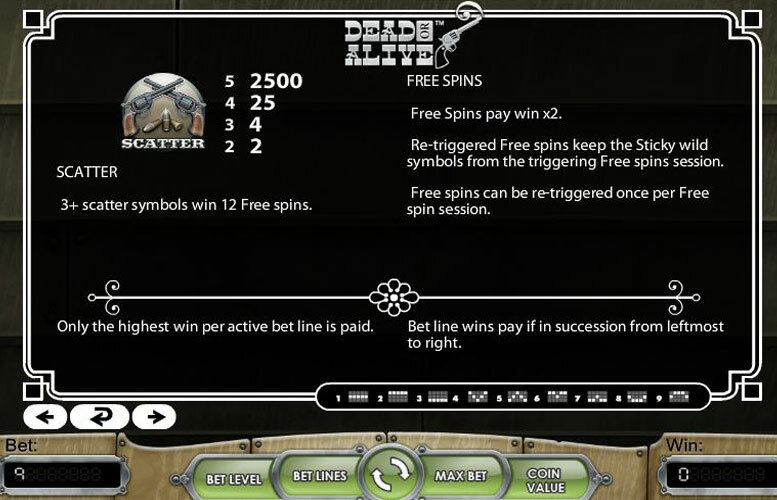 The highest payout on the regular reels actually comes from spinning five scatters, depicted as a pair of revolvers, which will pay the player 2,500 times their total stake as well as awarding them 25 free spins. Five wilds, whether during regular play or the free spins where they become sticky wilds, pay out the second best with 1,500 coins. The third highest payout is 1,000 coins for getting five of the sheriff’s badges on an active payline. During the free spins, wins are doubled, which helps to make these payouts worth more. Players can individually select lines by clicking the lines boxes on the side of the reel of clicking the lines button at the bottom of the display. The coin values for this game range from 0.01 to 0.50 and players have the ability to bet on lines up to four times. The maximum total bet for the game is 18 full coins, which is a relatively low maximum total bet. The low bets, combined with the chance to win 2,500 times the total bet, have made this game wildly popular. Wild (Wanted poster): The wild will substitute any other symbol, except for the scatter. Regular payouts for the wild are 1500 coins for a pattern of 5, 150 coins for a pattern of 4, and 25 coins for a pattern of 3. Wilds can become “sticky” during free spins feature, which means they will stay in place wherever they appear for the remainder of the feature. Getting one of these sticky wilds on each of the reels will reward players with an extra five free spins. Scatter (Pair of revolvers): Three or more of the scatters will always give players 12 free spins. When using these free spins, players’ earnings will be doubled. The feature can be retriggered to give players another 12 spins, but this is only allowed happen once for each complete feature. Getting five of these anywhere on the reels will award players with 2,500 times their total stake. Four award 25 times the total bet, three provide a 4x multiplier and two will reward players with double their total stake but no free spins. Sheriff badge: One of the higher paying icons, the sheriff badge hands out 1000 coins for a pattern of five, 125 coins for a pattern of four, and 20 coins for a pattern of three. Holster: The holster will pay 20 coins for getting three on an active payline. Four in a row pay 100 coins and five will pay out 750 coins. Cowboy hat: This classic cowboy accessory will pay players 400 coins for getting five of them in a row across the reels. A reward of 75 coins awaits players who spin four on a payline and 15 coins for three. Cowboy boots: Another accessory commonly seen, this will award 12 coins for sets of three, 60 coins for four and 300 coins four obtaining five of them that span the reels. Whiskey glass: Easily identified from beer glasses for their shorter stature, whiskey glasses will pay 200 coins for a set of five. An award of 50 coins is paid for four and 10 coins are the reward for getting three. A: The highest paying of the letter symbols, the A pays out 100 coins for a pair of 5, 20 coins for a pair of 4, and 10 coins for a pair of 3. K: The K offers payouts for sets of 3, 4, and 5 with a payout of 5, 15, and 75 coins. Q: The Q will pay 4 coins for three in a row. A player is paid 12 coins for finding four of them and 50 coins for finding five of them on any of the active paylines. J: Beginning with 40 coins for a set of five, the J symbol also hands out 10 coins for a set of four and 2 coins for triplets. 10: The lowest paying icon on the board, the 10 pays out 2 coins for a set of three, 10 coins for a pattern of four, and 25 coins for five on an active payline. This game has a rating of 2 / 5 with 37 total reviews by the users.